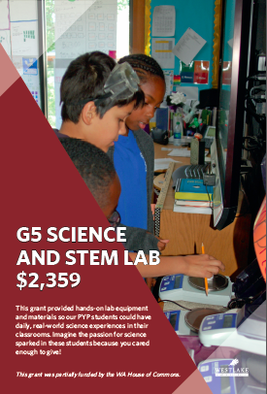 This grant provided hands-on lab equipment and materials so our PYP students could have daily, real-world science experiences in their classrooms. This grant was partially funded by the WA House of Commons. 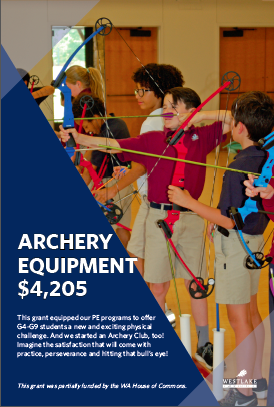 This grant equipped our PE programs to offer G4-G9 students a new and exciting physical challenge. And we started an Archery Club, too! This grant supports school leadership in attracting and retaining outstanding teachers who embody and inspire the IB philosophy. This grant helps students build their capacity as independent learners as well as to be better teammates during collaborative work. This STEM grant extended student opportunities to learn coding language that programs robots to perform activities like navigating a maze and transporting a load across a bridge. This grant will give teachers a deeper understanding of using inquiry-based approaches as well as a broader repertoire of strategies and techniques. Our students have access to this exciting new technology, thanks to Bonus Funds earned on North Texas Giving Day. Especially for our art and design students! 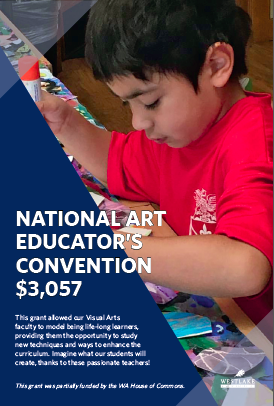 This grant allowed our Visual Arts faculty to model being life-long learners, providing them the opportunity to study new techniques and ways to enhance the curriculum. This grant supported our Mathematics faculty’s commitment to best practices in teaching, assessment and curriculum. This initiative will give WA its own brand new 71-passenger bus! Sporting our colors and “Hammer” logo, everyone will know when the Blacksmiths arrive! This grant was partially funded by the WA Athletics Club. This grant provided staff with the latest researched information for identifying and remediating learning disabilities for our special education students. This grant provided the necessary equipment for our students to be trained in CPR and basic life-support. This grant will enhance our international-mindedness by connecting with scholars from around the world to invigorate classroom teaching of the humanities.